Performers: Joana Lleys, Lizi Menezes, Miguel Ambrizzi, Paula Guedes, Tales Frey and Tânia Dinis. “wash again” and at same time means “herd”. There are two ideas in only one word. of Christian moral is castrating, which builds shame and guilt over the freedom of the subject. The action consists in six people washing their bodies, in front of a church. The body is not displayed. Everybody wash their bodies wetting their clothes. theatrical research, concerning the dialogue among video, theater, performance art and photography. The company also has invited artists to join the team in some works. Nature. And so, wherever the Dionysian prevailed, the Apollonian was checked and destroyed”. TALES FREY (Catanduva-SP, Brazil. 1982) lives and works in Brazil and Portugal as theatre director, art critic, art performer and video maker. At the moment, he is studying his PhD in “Theatre Studies and Performance”at the University of Coimbra, in Portugal, where he develops a practical and theoretical research: “Performance art and ritual: fashion and religion in body marks”. He showed his works (associated with Cia. Excessos) in Argentina, Brazil, Canada, China, Cuba, England, France, Germany, Malaysia, Portugal, Serbia and Sweden. In Brazil had a strong formation on the fashion field (UFRJ); Tales participated of a Scientific Initiation Research about Acting Studies, working as an actor at FIOCRUZ’s Museum of Life. In 2008, was selected to integrate a FUNARTE Centre at Sao Paulo in the process of “The Possessed” by Dostoyevsky. This spectacle was directed by Antonio Abujamra. Abujamra, is one of the most important figures on scenic set in Brazil, for who Tales also worked as an actor, but as director too, together with others twelve artists. In 2006/2007, he experienced the work with adornment for set and costumes design in side of Cláudio Tovar for the musical “Empire”, by Miguel Falabella (one of the most important figures on scenic set in Brazil). This work has received the Shell and Contigo Award for Best Costumes in 2007. Also in 2006, Tales worked as assistant director at the “Life in the Coca-Cola Side of Excellence”, event directed by Cláudio Torres Gonzaga. He performed at the event “Rapid Pulse Performance Art Festival” (2012) in Chicago, “Festival de Performance de Belo Horizonte” in Brazil (2011), “Stockholm Fringe Festival”, in Sweden (2011), “Soul Street” in Portugal with the performance art “For sale: debit card accepted” in 2009 and “Reciprocity soulless” in 2010. At Circo Voador (Rio de Janeiro) in 2007 and 2009, presented, respectively, with the performances “The Kiss” (2nd version) and “Canine Spasm”, and with this latest work, “performed ” in some units of the SESC in São Paulo between 2009 and 2010. Showed “Canine Spasm” in “Maus Hábitos” (2012). Conducted a series of video art, in 2009/2010, with the title “Videopolaroid” drawn up in some countries, including Argentina, France, Portugal and England. This work was included in website of “The Impossible Project”. He directed the short film “Hit-and-Miss” that was showed in “Short Film Corner” (Cannes 2011), “Videodanza BA 2011” and also “Festival Internacional de Videoarte de Camaguey” (Cuba 2011). Directed “Hit-and-Miss II” that was showed in “Filmideo 2012” in New Jersey – USA. Participated in the “Exquisite Corpse Vol 02″ together Bruno Penteado and this video art was exhibited between 2009 and 2010 in Germany (“Kulturpalast Wedding Internacional” in Berlin), Brazil (“Cine Design” in Recife, “Contact “in Sao Carlos and “Experimenta!” no SESC-Campinas), Canada (“Alucine Toronto Latino Media Festival” in Toronto), China (Wikitopia in Hong Kong), USA (“Artists Acces Televiosion” in San Francisco), France (“Videoforms Festival” in Clermont-Ferrand), England (“London Premiere” in London), Serbia (“Magasin” in Belgrade) and Sweden (“V.ART09” in Varnamo and “Supermarket Art Fair” in Stockholm). 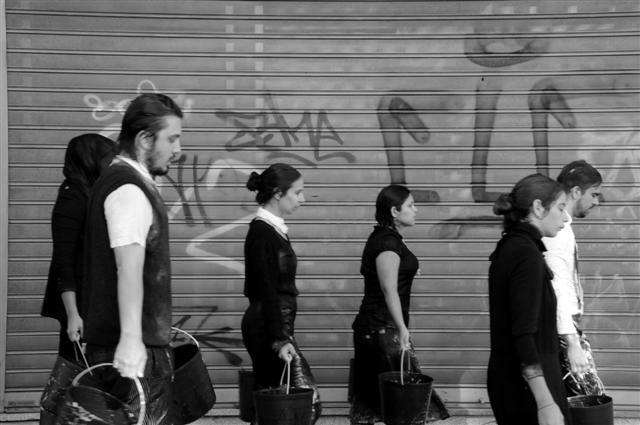 Directed “Traje de banho para sujar” in 2009, based on the “action painting”, causing a fusion of theater, dance and visual arts, in partnership with the Galpão 6 company. In Rio de Janeiro, he did the underground staging “The Red Shoes” by Caio F. Abreu (“…Ou Trash” SESC Campos and two seasons at the nightclub Fosfobox in 2007). He also directed “This Property is Condemned” by Tennessee Williams at the School of Communication at UFRJ. As an actor and director, did the short film “Adrema” in Porto (Film shown at the Crystal Palace in the event “Faz-me um bídeo” in 2010). As an actor participated in “Lilac Lamp” by Plinio Marcos, directed by Cecilia Carvalhal at Caixa Cultural Rio de Janeiro in February 2008. Art director for the project “The Three Sisters”, adapted from Anton Chekhov and directed by Rafael Souza-Ribeiro, for the Riocenacontemporanea Festival and for the Café Cultural Petrobrás season in 2007. Taught the course “The performance art as a process of creation” in some units of the SESC in Sao Paulo, at Galpão 6 in 2009 and the Estação Cultura of Catanduva – Sao Paulo in 2010. He was professor of theater for children and adolescents in the Ong Ação da Cidadania in Rio de Janeiro in 2007. Has Masterclasses with Antonio Abujamra, Eugênio Barba (Odin Teatret), Carlos Tejo, Carlos Simioni (Lume), Celina Sodré, Cláudia Borioni, Gerald Thomas (Companhia Ópera Seca), Iben Nagel Rasmussen (Odin Teatret), José Carlos Garcia (Cia. Chaptô), Julia Varley (Odin Teatret), Márcio Libar (Teatro de Anônimo), Rosi Campos and Alexandre Mate. Concluded the workshop “Artists Techniques and Methods” at Tate Modern in London. Has one experience for carnaval costumes at Sao Clemente School of Samba. At São Paulo, 2006, Tales received the prize for the Best Adult Costumes, showed at ALDEIA FIT – Sao José do Rio Preto. Best Director of Photography also on the Café Cultural Petrobrás – Short Films Festival, for the video “The corner”, directed and performed by Larissa Câmara.